Recent global cancer statistical data has clearly indicated that prostate cancer is currently the second most frequently diagnosed cancer (at 15% of all male cancers) and globally the sixth leading cause of cancer death in males. This book is a summary of prostate cancer, covering its incidence, epidemiology, and current treatment options. 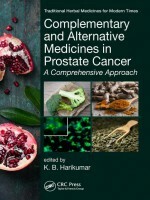 It also serves as an up-to-date review of the status of currently available alternative and complementary medicines for treating prostate cancer, including various plant extracts, herbal formulations, natural products, yoga, acupuncture, Ayurveda, homeopathy, and Siddha medicines used in prostate cancer therapy.